This Knit Sleeveless vest waistcoat is indispensable for your autumn winter.A slight stretch, warm, soft and comfortable for wearing. COOFANDY.Casual.Style.Comfort.COOFANDY builds on our comfort heritage with innovative style to give you the looks that fit your life, your daily look, and your style. Perfect to any occasions - Suitable for casual wear/ outdoor activity/ party everyday fashion. S Size: Shoulder: 16.1''/ Chest: 37.4''/ Center Back Length: 25.6"
M Size: Shoulder: 16.5''/ Chest: 39.4''/ Center Back Length: 26"
L Size: Shoulder: 17.2''/ Chest: 42.4''/ Center Back Length: 26.4"
XL Size: Shoulder: 18''/ Chest: 45.4''/ Center Back Length: 26.8"
XXL Size: Shoulder: 18.7''/ Chest: 48.3''/ Center Back Length: 27.2"
Comfortable Material --- Material: 50% Acrylic,50% Cotton;Cotton/Acrylic blend offers optimal softness and durability. 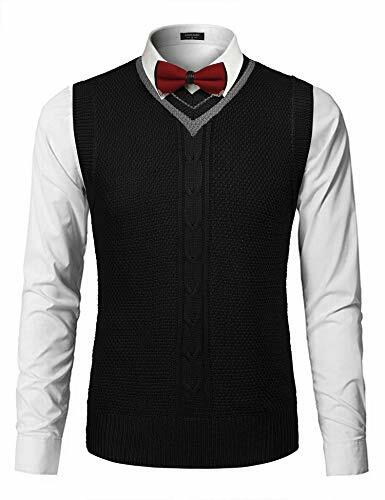 Design --- V-neck;thick cotton knit trim;contrast color;sleeveless;modern basic designed vest waistcoat;elasticity;high-end knit process,do not shrink, not the ball. Occasion --- A slight stretch, warm, soft and comfortable for spring and fall or for winter layering, suitable for casual wear/ outdoor activity/ party everyday fashion. Notice --- We offer a convenient refund service, but in order to save your time, Please check the size information under the product description before ordering, rather than the "size chart" beside the drop down box, please feel free to contact us if you have any problems about the Sweater vest. Garment Care --- Hand-wash max 40 degree, Normal Dry Clean, Iron max 110 degree,Do not bleach.